Mike Mussina pitched consistently well over 18 big-league seasons for the Baltimore Orioles and New York Yankees, winning a total of 270 games and becoming the first American League pitcher to win 10 or more games in 17 consecutive seasons. With a varied arsenal of pitches including four-seam and two-seam fastballs, a slider, a changeup, and a knuckle curve, he made five All-Star teams, won seven Gold Gloves, and nine times finished in the top six in Cy Young Award voting. His reliable excellence earned him induction into the Baseball Hall of Fame in 2019. Introverted and exquisitely focused on being the best pitcher he could be, Mussina was often percieved as aloof bordering on rude but always remained true to himself, his family, and the small town he called home. The oldest child of parents Malcolm Mussina, a lawyer, and Eleanor (Ellie) Mussina, a nurse, Mike had one sibling, Mark, who was born in 1972. Mark also achieved a degree of athletic success as a three-sport standout at Montoursville High School, being named first team all-conference in football, basketball, and baseball as a senior.2 He went on to play football and baseball at Susquehanna University and earned a degree in mathematics. Professionally he has worked in real estate, but is primarily known as a sports radio host. As of 2016, the entire family still lived in Montoursville. Mussina’s baseball “career” began at age 8 in the Montoursville Little League. It was on these Little League fields that he was given his lifelong nickname, Moose, not because of stature or temperament but because of the first syllable of his last name, pronounced meu-SEE-na, being similar to the animal.5 He pitched his first game for the Johnny Z’s Restaurant team at 10.6 He was quite successful, with other parents noting that Mike “was the first American who threw like one of those Taiwanese Little Leaguers,”7 a comment intended as a compliment with the Little League World Series being held one town over in Williamsport. Malcolm Mussina feared his son was getting a big head, sat him down and told him, “There must be 10,000 other kids who do what you do.”8 It was only a year later that “Little Mike” was throwing too hard for “Big Mike” (Malcolm) to continue playing catch with him. Mussina became a star for the Montoursville High School Warriors wearing his familiar number 35, compiling a 24-4 record with a 0.87 ERA, and leading the team to a state championship his senior year.9 Mussina was named the Pennsylvania State Baseball Player of the Year twice during high school.10 He also starred for the basketball and football teams while excelling in the classroom. He finished with the fourth highest grade-point average in his graduating class; however, there is speculation that this was intentional as the students with the three highest grade-point averages had to speak at graduation,11 a public forum that would be out of Mussina’s comfort zone. Mussina chose to attend Stanford University on a partial baseball scholarship, noting, “It was just sort of a given in my family that you went to college. Plus, for me, there was a lifestyle question. Did I want to spend three or four years riding buses around in the minor leagues, staying in little towns in lousy hotels, or did I want to have the chance to experience college while playing baseball at the same time. To me, it was a no-brainer.”15 Mussina stepped into the rotation of the defending College World Series Champion Cardinal as a freshman, finishing with a 9-4 record and a team-leading 20 starts as Stanford repeated as NCAA champions. A shoulder injury in his sophomore year limited Mussina to only eight games, but he bounced back his junior season with a 14-5 record over 20 starts. He was named an All-American while Stanford once again advanced to the College World Series, losing in the semifinals to eventual champion Georgia. The economics major, who had also joined the Delta Tau Delta fraternity, was once again draft-eligible and this time ready to sign. 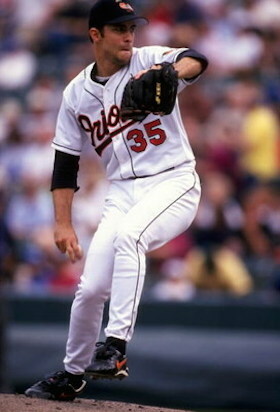 He was selected again by the Orioles, this time with the 20th overall pick in the first round on June 4, 1990. He signed on July 2, 1990, for a reported $225,000 signing bonus by scout Ed Sprague.16 The Orioles challenged him by assigning him to Double A, the Hagerstown Suns of the Eastern League, where he made his professional debut on July 19, 1990. The 1991 season saw a return to the Rochester Red Wings, where Mussina continued to impress, compiling a 10-4 record with a 2.87 ERA to win the International League Pitcher of the Year Award as well as his first big-league call-up, on July 31. He made his first major-league start on August 4. He pitched 7⅔ innings, giving up only four hits in his debut, but one hit was a home run by future Hall of Famer Frank Thomas, and he took a 1-0 loss. Mussina pitched effectively the rest of the season to a 2.87 ERA — identical to his Triple-A performance. In the offseason he was awarded the inaugural Palmer Prize as the top pitcher in the Orioles farm system. Mussina cemented his status as a big leaguer during the 1992 season, starting the campaign 5-0 and making his first of an eventual five All-Star Games. In what would become a habit of near misses in Mussina’s career, he fired a one-hitter on July 17 against the Texas Rangers, giving up just a double to Kevin Reimer. Leading the AL in winning percentage with an 18-5 record, Mussina finished fourth in the Cy Young Award balloting, the first of nine finishes in the top six, although he never captured the elusive top spot. Mussina got off to a strong start in 1993, starting the season 7-2 heading into a June 6 tilt against the Seattle Mariners. In the seventh inning, Mussina hit Mariners catcher Bill Haselman, who had homered earlier in the game, with a pitch in the shoulder. This incited a 20-minute bench-clearing brawl that resulted in three injuries and eight ejections. (Mussina was not among the eight. )18 While Mussina wasn’t obviously injured, over his next three starts he allowed 16 earned runs on 24 hits over 13⅔ innings,19 and missed the subsequent six weeks with a sore right shoulder and lower-back pain. Seemingly close to a return; he was named to the All-Star team, with the game taking place in Baltimore. AL manager Cito Gaston told Mussina he would likely not be used unless there were extra innings; however when Mussina took the bullpen mound on his own in the ninth inning for some between-start throwing and did not get into the game, the AL squad left the field after the game to a chorus of boos from the Baltimore fans.20 Gaston and Mussina later made up, and in 1994 Gaston had Mussina pitch the fifth inning of that year’s All-Star Game. The 1996 season saw Mussina come even closer to a 20-win campaign; he had 19 with four starts left in the season. He pitched poorly and lost his first two chances. In his third, he pitched 8-plus innings against the Milwaukee Brewers, leaving with a 7-5 lead that the bullpen couldn’t hold. In his final chance to get win number 20, he left a game against the Blue Jays with a 2-1 lead after eight innings, but closer Armando Benitez gave up a home run to Ed Sprague (the son of Mussina’s signing scout) to tie the game and cost Mussina the victory. The Orioles made the playoffs for the first time in Mussina’s career, but lost in the ALCS to the eventual World Series Champion Yankees. Mussina earned his first of seven Gold Gloves in the 1996 season. Mussina once again narrowly missed history on May 30, 1997, taking a perfect game into the ninth inning against the Cleveland Indians before yielding a single to Sandy Alomar Jr. with one out. He struck out the next two batters to finish the game. He took another no-hitter into the eighth inning less than a month later, on June 25, while facing the Brewers. It was in the 1997 postseason that Mussina had perhaps the finest moments of his career. He started the third game of the ALCS against the Cleveland Indians and allowed only one run over eight innings while striking out an American League postseason record 15 batters. He followed that by starting Game Six on three days’ rest and tossing eight shutout innings with 10 strikeouts. Mussina excelled throughout the entire 1997 postseason, allowing only four runs in 29 innings. Marriage came in the fall of 1997 when Mussina and Jana Lentz McKissick were wed on November 1. Lentz McKissick was also from Montoursville, although she had been two years ahead of Mussina in high school. It was a second marriage for her; Mussina adopted her daughter, Kyra, who was 8 at the time of the marriage. Mike and Jana had two sons, Brycen, born in 1997, and Peyton, born in 2003. Mussina’s 1998 season was marred by two trips to the disabled list, but he still reached double digits in victories. His first DL trip resulted from a wart on his right index finger. His third start back he was struck in the face by a line drive off the bat of Sandy Alomar Jr., suffering a laceration over his right eye and a displaced nasal fracture.25 He missed less than a month with this injury, although he later admitted he came back too quickly — “(E)ven though I tried not to think about it or worry about it, I was gun-shy. I was probably flinching on almost every pitch I threw for the rest of the season.”26 After a couple of rocky starts, Mussina once again flirted with perfection on August 4, 1998, in a game against the Detroit Tigers. He retired the first 23 batters he faced before yielding a double to Frank Catalanotto. He settled for a two-hit shutout that day. Pursued aggressively by large-market teams from Boston and both New York clubs, Mussina looked for a chance to play meaningful October baseball. Introverted and a homebody, he had long held doubts of how he would handle a large market, noting in 1996, “I felt Baltimore was a big media market when I got here. It would probably be a difficult adjustment (to New York or Los Angeles).”31 Ultimately, it was a recruiting phone call from Yankees manager Joe Torre that sealed the deal. Torre recounted, “I heard the rumor that (Mussina) didn’t like New York all that much because of the size of the city, and I didn’t want that to be the deciding factor without letting him know there are places in Westchester and Jersey where you can have quiet and space if you want.”32 Regarding the phone call, Mussina said, “That was probably the lead reason why I ended up here (New York).”33 Mussina agreed to a six-year, $88.5 million contract with the defending World Series champion Yankees. 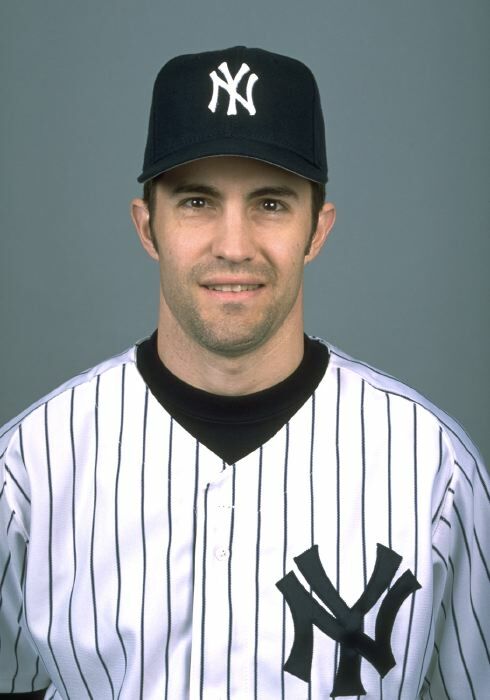 Mussina and Yankees made the playoffs in 2001, and Mussina threw seven shutout innings in a must-win Game Three of the Division Series against the Oakland A’s. This game is best remembered for Derek Jeter’s backhanded flip from up the first-baseline to nab Jeremy Giambi at home plate in the seventh inning. The Yankees would go on to lose the World Series to Arizona on a walk-off hit in Game Seven and it would be the closest Mussina would come to a World Series ring. Mussina’s next, and last, World Series opportunity came in the 2003 season, but to get there the Yankees had to beat the Boston Red Sox in the ALCS. Mussina pitched in Games One and Four, taking the loss both times. In the winner-take-all Game Seven, Mussina appeared in relief for the first time in his career after Roger Clemens ran into trouble in the fourth inning with no outs and runners on the corners, and the Yankees down 4-0. Mussina struck out Jason Varitek and induced a double-play groundball from Johnny Damon to escape the jam. He pitched three scoreless innings in the game, eventually won on Yankee Aaron Boone’s walk-off home run in the 11th inning. Mussina pitched seven shutout innings to win Game Three against the Florida Marlins in the World Series and was lined up to pitch in Game Seven, a game that never came when the Marlins won the Series in six games. Mussina’s Yankees contract ran out after the 2006 season and he re-signed that offseason with a two-year, $23 million deal. Chasing milestone win number 250, he entered the 2007 season with 239. Mussina agreed to be the subject of a book by John Feinstein titled Living on the Black: Two Pitchers, Two Teams, One Season to Remember, also featuring Tom Glavine in his quest for win number 300. The 2007 season would prove to be the most trying of Mussina’s career as he pitched to a career-worst 5.33 ERA and found himself briefly demoted to the bullpen in late August. After one effective relief outing, injuries led to an opening in the rotation, and Mussina seized the opportunity by changing his pitching philosophy and attacking the inside corner rather than living on the outside edge of the plate.41 Mussina won three games down the stretch and ended the season at 250 wins. Retiring to his home in Montoursville, Mussina remained active in the community, sitting on the board of directors for Little League International and coaching his children’s youth sports teams. In 2013 he was named the varsity boys basketball coach for Montoursville Area High School. Post-career accolades for Mussina included induction into the Orioles Hall of Fame in 2012, the Rochester Red Wings Hall of Fame in 2013, the Little League Hall of Excellence in 2014, and the NCAA Silver Anniversary Award in 2015. 1 Ken Rosenthal, “O’s ‘Mike Mystery’ Strong, Silent Type,” Baltimore Sun, April 28, 1996. 2 “Mark Mussina,” espnwilliamsport.com/local-personalities/mark-mussina/, accessed November 28, 2016. 3 Buster Olney, “A Throwback to His Roots. Mike Mussina: Armed With Determination as Boy, Orioles Ace Has Made Pitching Perfection a Lifelong Pursuit,” Baltimore Sun, February 25, 1996. 5 Brian Mathers, “Mussina, Mike Cole,” pabook2.libraries.psu.edu/palitmap/bios/Mussina_Mike.html, accessed November 29, 2016. On the pronunciation of Mussina’s name, see baseball-reference.com/players/m/mussimi01.shtml. 6“Mike Mussina, Former Major League Baseball Pitcher, Member of the Little League International Board of Directors, to Be Enshrined in the Little League Hall of Excellence,” sportsheritage.org/public-news/mike-mussina-former-major-league-baseball-pitcher-member-little-league-international-board-directors-enshrined-little-league-hall-excellence/, accessed November 28, 2016. 10 Buster Olney, “You Can Go Home Again; Devotion to Small Town Is a Way of Life for Mussina,” New York Times, October 11, 1997. 11 Buster Olney, “Man Who Likes Quiet Comes to Noisy City,” New York Times, December 6, 2000. 13 Joe Student, “1987 Mike Mussina Scouting Report — ‘Father ... Won’t Accept Less Than $250,000! !” bustedcoverage.com/2014/01/09/1987-mike-mussina-scouting-report-father-wont-accept-less-than-250k/, accessed November 29, 2016. 14 John Feinstein, Living on the Black: Two Pitchers, Two Teams, One Season to Remember (New York: Little, Brown and Company, 2008), 25. 16 Patti Singer, “Minor League Notebook,” Rochester Democrat and Chronicle, July 8, 1990. 18 “Baseball; Toll From Brawl: Three Injured, Eight Tossed,” New York Times, June 7, 1993. 19 Thomas Boswell, “Foul Brawl: Fight With Mariners Might Show Mussina as a Late Loser,” Washington Post, June 23, 1993. 20 Mark Maske, “Mussina Will Tell Gaston He Is Sorry,” Washington Post, July 26, 1993. 21 Buster Olney, “2131:With Streak Second to None, Cal Ripken Jr. Trots Into Record Books,” Baltimore Sun, September 7, 1995. 22 Buster Olney, “Our Town: A National Tragedy Hits Home for Orioles Pitcher Mike Mussina,” The Sporting News, March 3, 1997. 24 Joe Strauss, “O’s, Angelos Deal, Keep Their Ace,” Baltimore Sun, May 4, 1997. 25 2000 Baltimore Orioles Media Guide, 129. 27 Mike Mussina Foundation, mikemussinafoundation.org, accessed December 1, 2016. 28 2000 Baltimore Orioles Media Guide, 132. 30 Tom Verducci, “Winning Pitch,” Sports Illustrated, December 11, 2000. 36 Ken Davidoff, “Moose Not So Loose,” Newsday (Long Island, New York), September 21, 2002. 38 Murray Chass, “On Baseball; Mussina Gets No. 200, But He’s Pitching Ugly,” New York Times, April 12, 2004. 39 Tyler Kepner, “The Yankees Rebound, but Damon Falls to the Side,” New York Times, July 6, 2006. 40 IMDb, “Wordplay,” imbd.com/title/tt0492506, accessed December 1, 2016. 42 National Baseball Hall of Fame Player File. Henry Schmidt and Sandy Koufax are the others. Lefty Williams and Eddie Cicotte also both won 20 in their last season, but were banned from baseball in the Black Sox scandal. 43 Baseball-reference.com,, accessed December 1, 2016.